+ A master bedroom, a small bedroom and a living room with a convertible sofa bed. + Air Conditioning and centralized heating. We stayed 8 nights over Christmas and our experience was great-the apartment is in a great location and Chris made us feel welcome and he was very responsive to our needs..We would definitely stay here again. Thank you! This was my first time using the VRBO to book a room. I was very skeptical at first. I really enjoyed my stay at this property. It was very spacious and clean. Chris was very nice and made us feel welcomed. 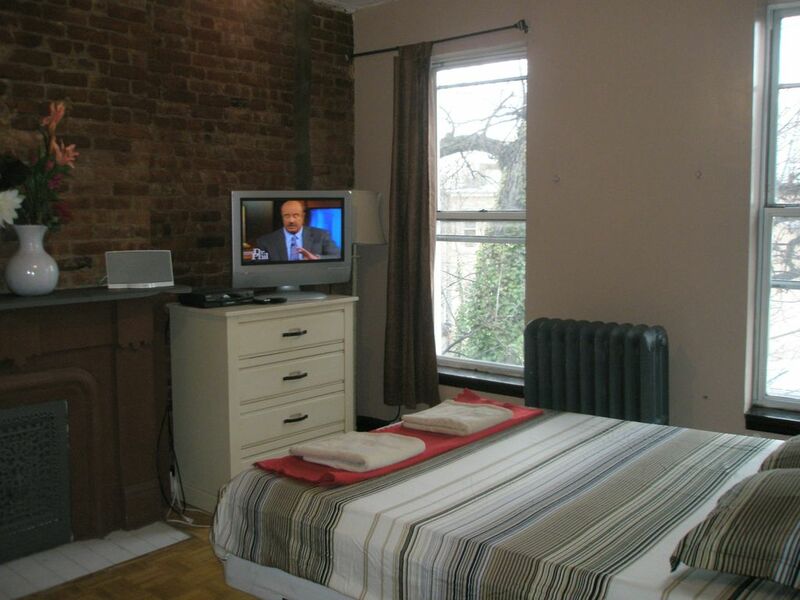 I would definitely recommend this property for anyone looking to stay in the Bedford-stuyvesant area. I will definitely book this room again in the future. This rental is in a great location in Brooklyn. There are terrific restaurants (especially Seraghina and Peaches) and cafes nearby, and it is very close to the A and C subway lines for quick access to Manhattan. The unit itself is light, clean, and spacious. The owner is very responsive when contacted. Great place, close to shops and restaurants and to the subway. Nicolas is quick in answering questions you have prior to arrival. Chris was super helpful at the house, thank you so much. We stayed with 4 adults on the 3rd floor which has plenty of space and nice bathroom and kitchen. Charming brownstone that is a bit noisy due to creaking floors. We would definitely stay again and recommend to anyone. Neighbourhood is nice and Manhatten is very close. We were looking for a reasonbly priced place for our family of four to stay that had free parking and allowed easy access to Manhattan. We found it here. We loved the neighborhood. It seems to be on the edge of the wave of gentrification. Lots of character, fun restaurants, etc. And the commute to Manhattan was super easy. Chris was very available to us and responsive. It's cozy for sure, and not a luxury place (kitchen and living room furnishings could use an upgrade), but it was more than sufficient for our needs. This is the true New York with it's Live Music, Block Parties, Street Festivals, Outdoor Film Festivals, Garden Parties, Wine Tastings, Book Readings, Poetry Readings, Chess Tournaments.